Leaves are plant organs primarily adapted for photosynthesis, although many species have modified leaves that serve a variety of functions besides photosynthesis. Imagine walking through a forest on a summer day surrounded by the green leaves attached to the branches of trees, shrubs, and herbs. The grain in a nearby farmer's field is a sea of narrow green grass leaves, and the pond behind his barn has green water lily leaves floating on the surface and the green leaves of cattails protruding from the water. At first glance one might come to the erroneous conclusions that all leaves are green, and that which is green in nature is a leaf. While often this is the case, there are numerous exceptions. Plant organs are green because of the presence of chloroplasts in the cells near the surface, which reflect green light and absorb other wavelengths as a source of energy for photosynthesis. Certain cells in many leaves contain these organelles , but chloroplasts are also found elsewhere in other organs, such as the stems of cacti of the desert and twigs of sassafras trees in the deciduous forest. In addition, flowers such as the head of broccoli, and fruits such as watermelons also contain chloroplasts. Conversely, many leaves are not green. The winter holiday season brings potted poinsettia plants into many homes. The bright red or pink organs on these plants are not the flowers; they are specialized leaves called bracts, with cells that contain so much pigment that the limited amount of chlorophyll in the chloroplasts is obscured from view. Some poinsettias are white; usually a close look reveals that they have a green tinge due to the presence of a few chloroplasts. Poinsettias do, however, produce flowers. They are less conspicuous small, round yellow and green organs nestled at the apex of the stem, surrounded by the colorful modified leaves. Similarly colored pigments are present in virtually all leaves, but there is often an abundance of chlorophyll, which predominates during the summer months. However, the green chlorophyll pigment often degenerates as summer transitions to fall, yielding leaves with vibrant red, yellow, brown, and orange pigments that were hidden during much of the growing season. What defines a leaf? An organ is a leaf, and not some other organ, if there is a lateral bud in the angle above where the leaf stalk attaches to the stem (called the axil of the leaf). Under the proper circumstances, lateral buds can grow into a branch, a shoot with flowers, or a modified branch such as a thorn. Most true leaves in vascular plants are attached by petioles (leaf stalks) to stems at specific locations, called nodes. In many plants, near the base of the petiole there is a layer called the abscission zone, which has cells that degenerate during senescence, the aging of the leaf, and ultimately form the weakest point. This allows the leaf to drop from the tree in autumn in deciduous forests. If only one leaf is attached at each node, the plant has an alternate leaf arrangement; if the leaves occur in pairs at the node, the arrangement is opposite; and more than two leaves can even be attached in a whorl similar to the ribs of an umbrella. Typical leaves are flat, multicellular organs with a single layer of cells on both the upper and lower surface forming the epidermis, a sheet of cells without chloroplasts. Scattered throughout the epidermis (primarily the lower epidermis) are pairs of specialized cells with chloroplasts called guard cells . 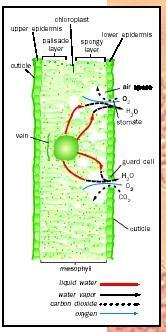 A pore, the stoma, lies between these cells, and allows gases to pass into and out of the leaf. This includes the carbon dioxide needed for photosynthesis, the oxygen it produces in the light-dependent reactions, and escaping water vapor resulting from transpiration. The outermost side of the epidermis is generally coated with the cuticle, a waxy layer produced by the underlying cells. This layer is impervious to water and restricts or prevents evaporation from tissues within the leaf except through the stomata , the structure formed by the guard cells. When the guard cells swell, the stomate closes, and this prevents the leaf from drying out. Between these protective epidermal layers, the leaf is filled with thin-walled parenchyma cells containing chloroplasts. Photosynthesis occurs within these cells, and evolution has produced modifications to aid this process. For instance, the cells in the layer just beneath the upper epidermis (closest to the incoming sunlight) are lined up like the logs driven into the ground to construct the stockade of a frontier fort. The cells in this palisade parenchyma are extremely efficient in capturing light, thereby enhancing photosynthesis. Parenchyma cells below the palisade layer form the spongy mesophyll, so called because they are often loosely packed allowing for air circulation between them. A network of veins is found within this layer, composed of both xylem to conduct water in the transpiration stream, and phloem to transport water containing sugar produced by photosynthesis in the leaves to other parts of the plant (translocation). Larger veins can be seen in thin leaves when they are held in front of a light, with many small veins nested between them. Finally, a major vein, the midrib, often runs from the tip of the blade to where it joins the petiole. However, some species have more than one major vein, resulting in a fan-shaped (palmate) pattern of venation. The shapes, sizes, and fine details of leaves are highly variable, and many leaves do not fit this typical pattern. Evolutionary selection pressures favor modifications that result in the leaves being adapted to many different environments. Leaves of plants living in dry habitats have a number of adaptations to reduce water loss. Stomates may be sunken into the leaf tissue within a moist depression or chamber, causing a reduction in the rate of evaporation; fine hairs may protrude from the epidermal cells, giving the leaf a "white" appearance that reflects sunlight and helps cool the leaf; or the cuticle may be very thick to prevent virtually all water loss. Leaves on aquatic plants have big intercellular air spaces that facilitate flotation, and the stomates are generally on the upper surface of the leaves allowing gas exchange with the air. Even leaves on the same plant can differ, with those exposed to bright sunlight being thicker and smaller while those in the shade being larger and thinner. Finally, many leaves take different shapes and may have special functions, such as the flasklike structure that captures insects on a pitcher plant; the tendrils of climbing pea plants; the spines on a cactus; the needles on a pine; or the expanded leaf petiole forming a stalk of celery. 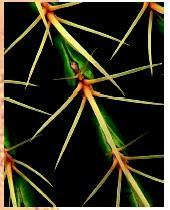 Many leaves, like the spines of this cactus, take different shapes and may have special functions. De Graff, K. M., S. R. Rushforth, and J. L. Cawley. A Photographic Atlas for the Botany Laboratory, 3rd ed. Englewood, CO: Morton Publishing Company, 1998. Perry, J. W., and D. Morton. Photo Atlas for Botany. Belmont, CA: Wadsworth Publishing Company, 1998.